Many websites have private areas only available to authenticated users. WebCopy supports two methods of authenticating with such websites, form based and challenge based. 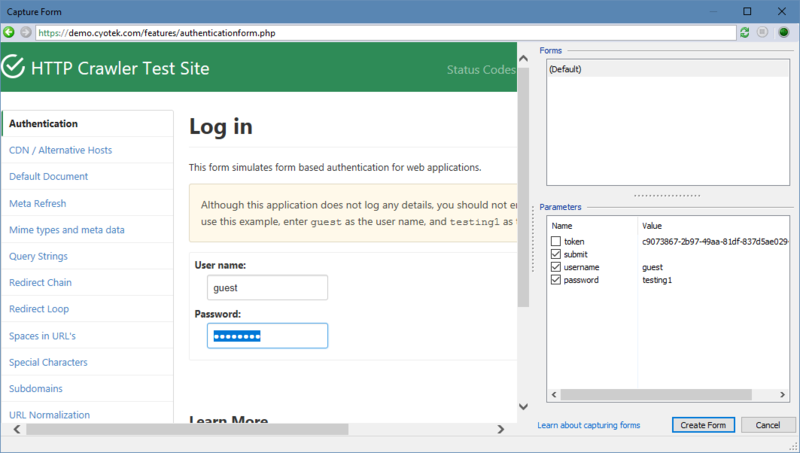 This tutorial will demonstrate how to use forms authentication. The simplest way to add a form definition to WebCopy is to use the built in capture tool. By default, WebCopy will automatically select all non-hidden parameters. The hidden parameters are often still required, but WebCopy will automatically pull them out of the form each time it is posted. This means that forms using dynamic values such as anti-forgery tokens can be submitted by WebCopy. Click the Create Form button. This will automatically create a definition pointing to the correct URL for posting the form, along with the parameters you defined, and then close the tool. Password and form data is stored unencrypted within a WebCopy project file. When copying a web site, WebCopy will submit any form definitions before copying commences after which the copy will progress as normal. If you followed this tutorial using the WebCopy demonstration website, a number of additional pages will be present, such as authenticationprofile.php.